People warned me for fuel warming up, but I don’t think that will be an issue. The amount of time the fuel is near the engine (in the fuel rail) is very small, as it will pass it in quite a high speed. I Also chose this setup because it’s quite difficult to have the fuel tank changed to a bigger outlet en have a return inlet created. Once the fuel is circulated this setup should always have enough fuel, even with the 6 mm tank outlet. The 6 mm tank outlet only has to provide the used fuel. As this engine has a better fuel-economy than the VW beetle engine, the 6 mm should be more than enough. The 22 mm pipe will act as a very very small splash tank. If the fuel warming proves to be a problem, I will switch to an in-tank fuel pomp like Subaru has. 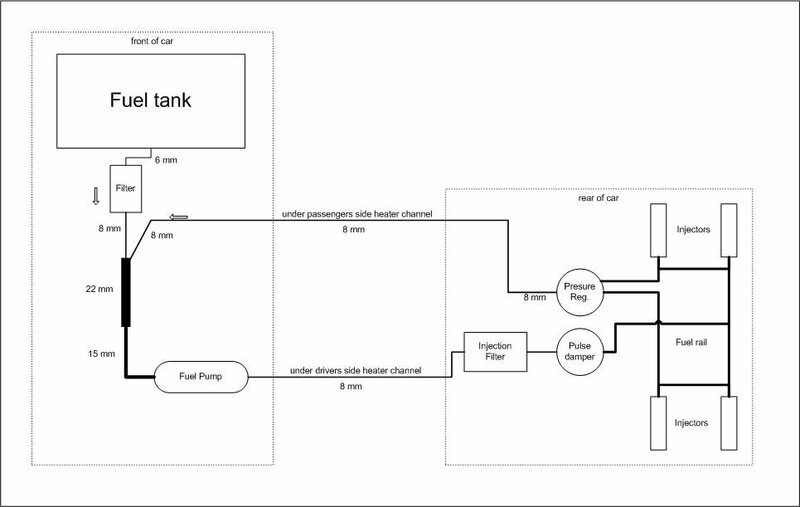 The placing of the fuel lines and the pump in the front was difficult. 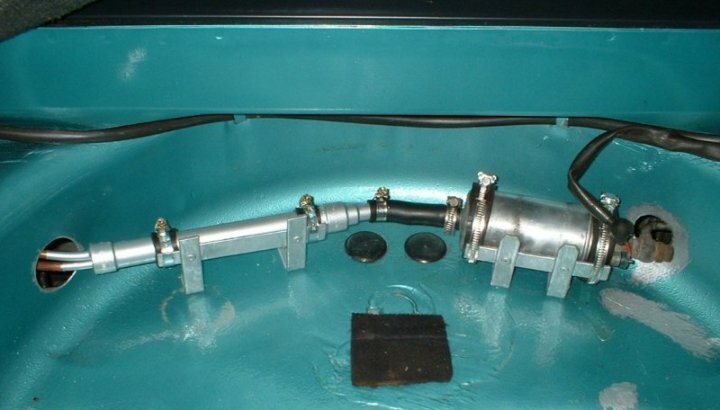 Because of the steering-gear there aren’t many places to place the lines of pump. 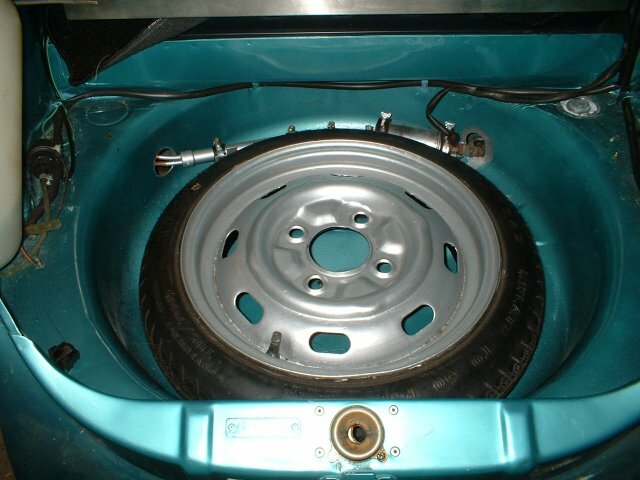 Finally I decided to rout the lines and pump via the spare wheel well. Luckily I bought a beetle rim with a bring-me-home tire on it years ago. This gave me room for the “splash-pipe” and pump. 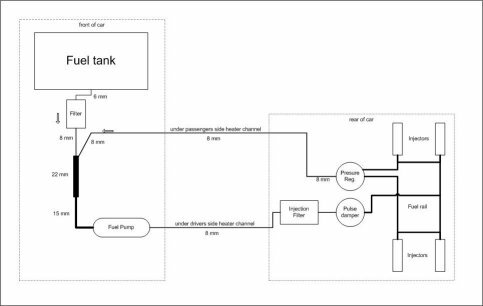 I still have to connect the fuel lines, place a fuel filter and place the passengers side (return) line. 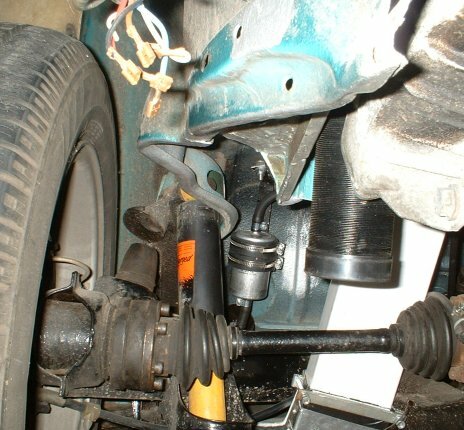 I used the mounting point where normally the big heater hose “bracket” is connected. I made a bracket out of a piece of alumium and attached the filter to it with big hose clamps. The filter is originally intenede for a 1994 Fiat Punto. This filter is nice, because it has 8 mm in- and outlets. Now I can attach the line to the tank in the front and put some power to the fuel pump to test it! edit 06-05-2007: I had a problem that the engine wouldn’t run right. As soon as I touched the gas pedal, the engine began to sputter and stalled. I suspected the fuel pump, as it was a junk yard pump and it made a lot of noise. 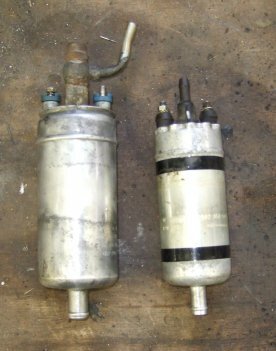 The pump came from another Alfa Romeo 33, but when I checked the Bosch part number, it turned out to come from a Mercedes! So, it allready was second hand when it was installed in that Alfa Romeo 33. After installing it, it still didn’t run right… It turned out I swapped two connectors of the engine wiring… So it wasn’t the pump after all, but at least I have the correct pump for this engine now.